Brooklyn, NY - The phrase “Home Sweet Home” will take on new meaning for over 100 prospective tenants who will be lucky enough to score an apartment at the site of the former Domino Sugar Factory through an affordable housing lottery being conducted through New York City’s Housing Connect program. The lottery begins today for 104 apartments at 325 Kent Avenue, the first of five buildings planned for the waterfront Williamsburg property. Despite the building’s location in the heart of Williamsburg’s Jewish community, Yiddish language applications and information are not being provided although that same information is available in Spanish, Arabic, Chinese, Haitian Creole, Korean and Russian. 40 of the apartments will be single occupant studio apartments with monthly rentals of $596 or $754, with 49 one bedroom apartments for one or two residents priced at $640 or $810 per month. Just 15 two bedroom units for households of two to four people are including in the housing lottery, with two priced at $775 per month and the remaining 13, with monthly rentals of $979, available to those with an annual household income ranging between $34,972 to $54,360. All rentals include gas, heat and hot water. Preference for the apartments will be given to New York City residents, with half of the apartments in the lottery allocated for residents of Community Board 1 which covers Williamsburg and Greenpoint. A small percentage of the apartments will be reserved for applicants who have mobility, vision or hearing disabilities. The 16 story structure, with sweeping views of the East River and the Williamsburg Bridge, will have a lobby with a 24 hour attendant. Curbed NY reported that the building, shaped like a squared off donut, will feature 500 apartments, with five levels of parking, bicycle storage and fitness and recreation facilities available for an additional fee. Construction at 325 Kent Avenue is expected to be completed sometime in 2017. Developer Two Trees plans to construct a total of 2,800 apartments on the 11 acre site which will also include office, community and retail space. 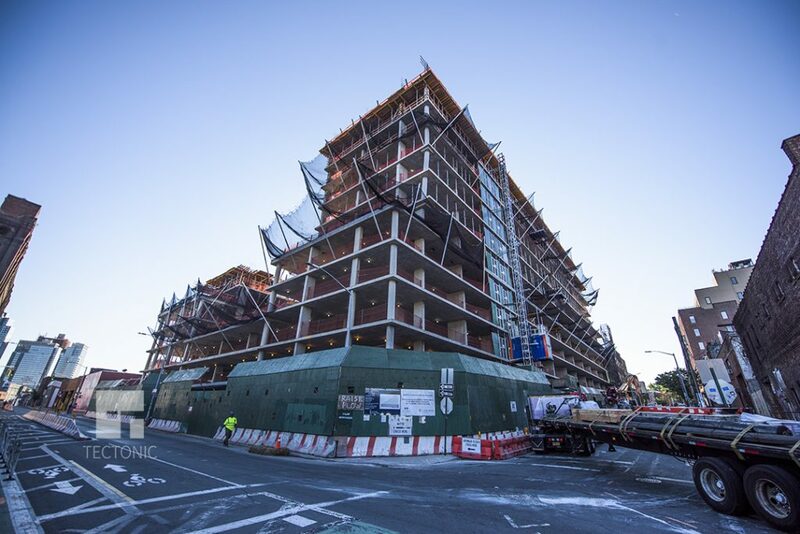 As previously reported on VIN News (http://bit.ly/2fJ2Fx5), 700 apartments within the development are expected to be designated as low to moderate income housing. Non of these apartments are really suitable for the Jewish community. Plus,just 15 units will have two bedrooms which you have to be extremely lucky to get. So the big question is still open: Where in the world are our supposed Askonim when we need them? Why in the world should we even listen to the Askonim when they beg the community to vote for whom they endorse? Why should we even vote in general when we get nothing in return? Why would our big Machers and Askonim make sure that Chassidic greedy developers are getting all kind zoning changes in their favor? Why wont these Askonim/Machers put down their feet and request that for each development these greedy Chevra are seeking zoning changes they must provide some affordable units? Aren't these money hungry millionaire developers rich enough? Aren't these developers afraid of blood money? getting rich on poor/average Bal Parnose. I hope Satmar doesn't ruin this for everybody. I am not sure that these buildings were put up by ours so I can not shoot off blame. I CAN ask why, in NY today, all obscure languages are offered but Yiddish. It seems like someone is saying, We don't want your type. High rise low income buildings have not fared well in NYC. A better model has been high rise with 20% low income in the building. Seems to me that families with children should have priority, not studio apartments. Just saying. “ Non of these apartments are really suitable for the Jewish community. Plus,just 15 units will have two bedrooms which you have to be extremely lucky to get. 1) those filthy rich developers work very hard to get approvals, then they have to raise funds, then they actually have to build it, after many years of hard work they finally start to see some profit, if you think it's so easy why don't you need try to do it. 2) nobody is forcing poor people to buy real estate in the most expensive location on earth, there are many affordable Jewish communities over the try state area, it's a self-imposed getto we created for ourselves. 3) I imagine that you'd like to see people that are not developers building the developments but that's physically impossible, because once you build a development you're now a developer yourself! Ha ha welcome to the club of these greedy filthy rich people. Please consider reading the post before commenting. This is not, as you imagine, a low income project. It is actually a high income high rise with about 20% low income. The location is one of the most sought after locations in Brooklyn and it is within walking distance of frum Williamsburg. I am not Chasidic yet I take it as a personal afront that applications are offered in all myriad languages but Yiddish. This is expecially galling when half the low income apartments are reserved for residents of that district which is primarily Hispanic and Yiddish speaking. These seem to be wonderful, affordable homes in a nice area. It is always nice to see new apartments become available.